MIT researchers found that activation of the parahippocampal gyrus was associated with better memory if visual scenes followed. Abstract: "The rate of learning or memory formation varies over time for any individual, partly due to moment-to-moment fluctuation of brain state. Functional neuroimaging has revealed the neural correlates of learning and memory, but here we asked if neuroimaging can causally enhance human learning by detection of brain states that reveal when a person is prepared or not prepared to learn. The parahippocampal cortex (PHC) is essential for memory formation for scenes. 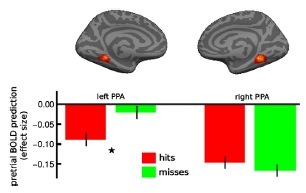 Here, activation in PHC was monitored in real-time, and scene presentations were triggered when participants entered "good" or "bad" brain states for learning of novel scenes. Subsequent recognition memory was more accurate for scenes presented in "good" than "bad" brain states. These findings show that neuroimaging can identify in real-time brain states that enhance or depress learning and memory formation, and knowledge about such brain states may be useful for accelerating education and training." It's interesting that the parahippocampal gyrus also seems to be involved with exposure to novel stimuli. Perhaps that's why many talented teachers think about using a 'hook' to awaken the interest of their students. The paraphippocampus may turn on and the following lesson becomes much more memorable as a result.